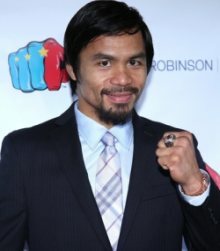 WBA welterweight champion Sen. Manny Pacquiao has accepted an invitation to speak before the Oxford Union, the university’s prestigious debating society, in Oxford, a city in southeast England 51 miles from London, on Nov. 5 and the event will precede a likely US press tour to announce his fight against Adrien Broner. A source in Pacquiao’s camp said negotiations and contracts are being finalized to lock in the Broner fight, tentatively in Las Vegas on Jan. 19 but even as it’s 90 percent sure, there is no absolute certainty at the moment. Pacquiao is expected to leave for the UK on Nov. 3, speak in Oxford then return to Manila before embarking on the press tour. Oxford Union secretary Tom Brown forwarded the invitation from society president Stephen Horvath to Pacquiao who will join the ranks of several distinguished speakers in the past. Oxford Union was established in 1823 and is the third oldest student union in the UK. Oxford is known as the oldest university in the English-speaking world. Previous speakers included Winston Churchill, Robert Kennedy, Ronald Reagan, Jimmy Carter, Bill Clinton, Mother Teresa, Benazir Bhutto, Margaret Thatcher, Henry Kissinger, Madeleine Albright, John McCain, Yasser Arafat and Albert Einstein. From show business, among the past speakers were Johnny Depp, Morgan Freeman, Clint Eastwood, Orson Welles, Elton John, Michael Jackson and Warren Beatty. From sports, the roster listed Roger Bannister, Diego Maradona, Boris Becker, George Foreman, David Haye, Vitali Klitschko and Chris Eubank. Horvath said Pacquiao’s presence will continue the “fine tradition” of the society hosting world leaders in various fields. “As the first and only eight-division world champion and the winner of 11 world titles, your legacy as a world champion professional boxer is unmatched,” said Horvath. “Your strategic brilliance and your remarkable speed make you a truly legendary fighter. We would be delighted to hear more about how you stood above the characteristic trash-talking of big fights to stay focused on winning. You have applied this determination and endurance to your political career as well, overcoming an initial setback in your first election to become a widely-popular and respected Senator. Horvath said Pacquiao’s appearance will be filmed for the union’s YouTube channel which has received over 60 million views since its recent relaunch. Pacquiao was asked to choose a date in the school’s autumn term from Oct. 8 to Dec. 1 to speak before the society. It won't be Pacquiao's first visit to the UK. In 2009, he did a press tour to promote his fight against English hero Ricky Hatton who was knocked out in two rounds in Las Vegas. In 2015, he was invited by Prince Harry to visit London for dinner and a tour of Buckingham Palace. Pacquiao presented Prince Harry with a pair of autographed Cleto Reyes boxing gloves.